When I finally committed to creating a morning routine, I struggled for a number of months trying to get up at a decent time. It actually took me almost a year before I was able to consistently get up early! For months my alarm would go off and I would just hit snooze. This went on for way too long, but I stuck with it until it became a habit. Part of it was willpower, part of it was setting myself up for success. I put my alarm in my kitchen so when it went off, I would have to physically get out of bed to shut it off. Once I was up and moving it was easier to stay awake and moving. I like to go to the gym in the morning so I would put my workout clothes on the couch the night before. This way, when the alarm went off, I knew there was one less thing to do in the morning. This made it easier to get moving because I didn’t need to think things through—I could just get going. I would literally “practice” getting out of bed. This was a funny technique that I learned from a coach who specializes in helping people with their morning routine. Yes, there are coaches that do this! Step 1 - In the middle of the day get yourself ready for bed. Step 2 - Get into bed and get yourself comfy. Step 3 - Set an alarm for 5-minutes later. Step 4 - Close your eyes as if you’re going to sleep. Step 5 - As soon as the alarm goes off jump out of bed immediately. Step 6 - Do the first thing you would typically do in the morning. i.e. Go into the bathroom, drink a glass of water, stretch etc. Step 7 - Repeat this process 3 or 4 more times and do this a few times over a week. Oddly enough this process actually worked! You are basically training yourself to get up when you hear that alarm. It was comical how well this worked for me! 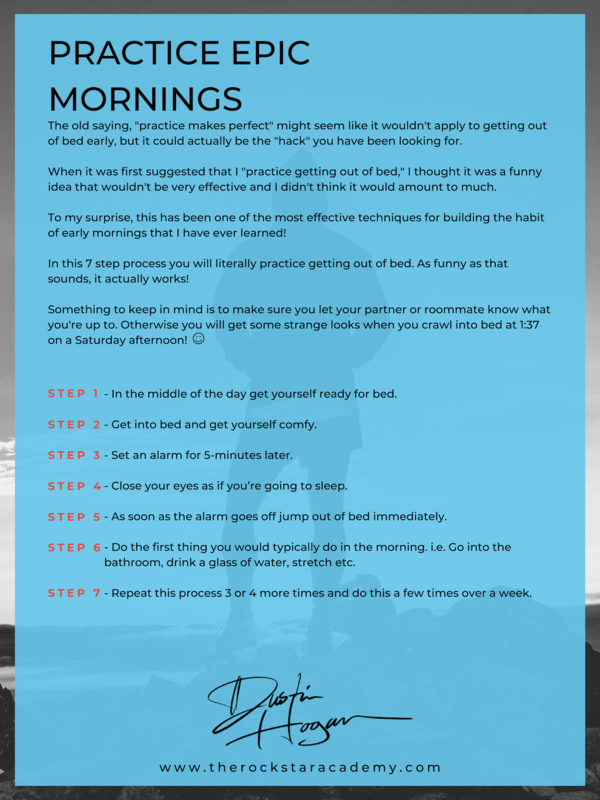 I created this handy little guide (download below) to help you "practice" your morning routine. Once I was able to consistently get out of bed early, I began creating the actual routine that I went through in the morning. I strongly believe that the habits and rituals in your morning routine are something that should shift and change over time. Also, an important thing to keep in mind is that developing a powerful morning routine is something that is a long-term plan. Not something that needs to be executed with perfection 100% of the time. This was a big breakthrough for me in my thinking. Understanding that if I am travelling, if it is a holiday, if I am sick or any other factor that may affect my morning routine, that missing a day or two isn’t the end of the world. Go for long-term consistency, not short-term perfection with your morning routine. 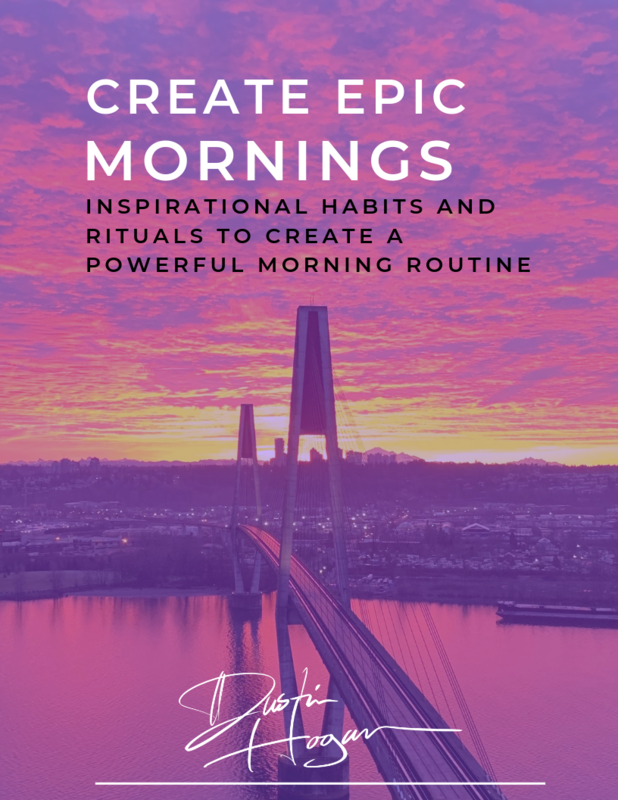 When it came to choosing the habits and rituals I included in my morning, I looked for inspiration by researching and studying the morning routines of people I admired. Entrepreneurs, musicians, artists, politicians and everyone in between. When researching morning routines, I discovered that each individual personalized their morning routine to fit their life and most importantly, their goals. I also recognized that not everyone had this long drawn out process that they went through every morning. They only added the habits necessary to support their goals. By far the biggest takeaway I had was the level of consistency with which they dedicate to their morning routines. Like anything, inconsistent effort is going to bring about inconsistent results. Currently, this is what my ideal morning routine looks like this. Things fluctuate slightly from day-to-day. For example, I am not going to the gym 7 days a week. Sometimes I only meditate for 5 minutes. If I go out for breakfast I may not have a shake. What does remain consistent is the time I get up, cold showers, reviewing my goals and taking a look at my calendar. The most important thing to keep in mind is to develop a morning routine that suits you and the goals and dreams that you have. Your morning routine should challenge you, but if it feels like a chore then you won't be doing it for very long. As I mentioned, I came up with ideas for my morning routine by studying and researching the morning routines of people I admired. This was a great way to get inspired and also understand that a morning routine doesn't need to be this complex process that drags on for hours. And to spark even more inspiration for you, have a look at this downloadable pdf that gives a behind-the-scenes look into the morning routines of many icons of business, art, music and life. Truly rocking your morning actually begins the night before. Preparation is key and puts you in the best position to succeed. Preparing and planning for the day ahead will allow you to eliminate and avoid some of the resistance you may encounter in the morning as you begin your day. No matter how motivated you are when you go to bed, there will be times when you wake up and simply don’t feel like getting your day going. To make it as easy as possible to get going, preparing a few things the night before means that you have less to think about in the morning. This will make it so much easier to get moving and take action. It is interesting that we can go to bed feeling ready to take on the world the next day but then when tomorrow arrives, we become the world’s best negotiator and have every excuse in the book for why we should stay in bed. Having a powerful evening routine is just as critical to rocking your morning as choosing habits and rituals that serve you and your goals. 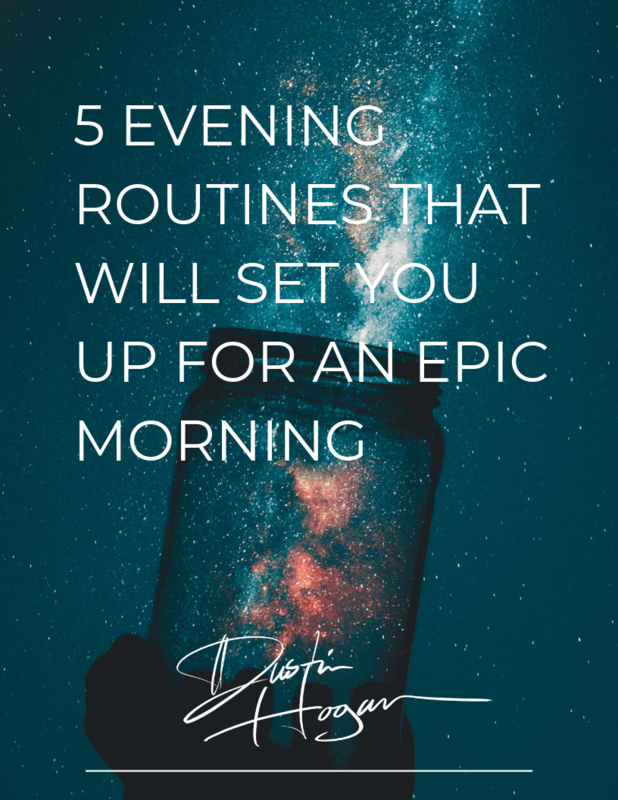 To get you thinking about what you can do in the evening to set you up for success, I created this guide that shares 5 evening routines you can use to set you up for an epic morning. You can download it below. I think you will dig it. As much as I love writing about morning routines, the real work begins when you start taking action. In most cases when it comes to making a shift in your life, my suggestion would be to take massive action. In this case though, my suggestion is that you ease yourself into creating a powerful morning routine. The reason I suggest you ease yourself into your morning routine is that sticking with your morning routine is important over the long-term. It is something where consistency is king. We're talking about having a marathon mindset here! When it comes to designing a powerful morning routine that is balanced and actually sticks, it is best to focus on habits and rituals that fit into 3 different areas of focus. Sometimes the most difficult thing to do in the morning is to just get going. The sooner you can engage your body, the easier it will be able to keep that momentum going. By choosing habits and rituals that engage your body, you are physically priming yourself for the day ahead. Nourishing your mind is just as important as feeding your body. Using the morning to focus on what matters most will give you the mental stamina you need to tackle the day. Balancing out your morning routine by focusing on spiritual wellness not only connects you to a higher power, but it also allows you to feel more connected to those around you. By focusing on habits and rituals that cover body, mind and spirit, you are creating balance in your morning. This balance will give you the energy you need to win your morning, and more importantly, the energy to win your day! 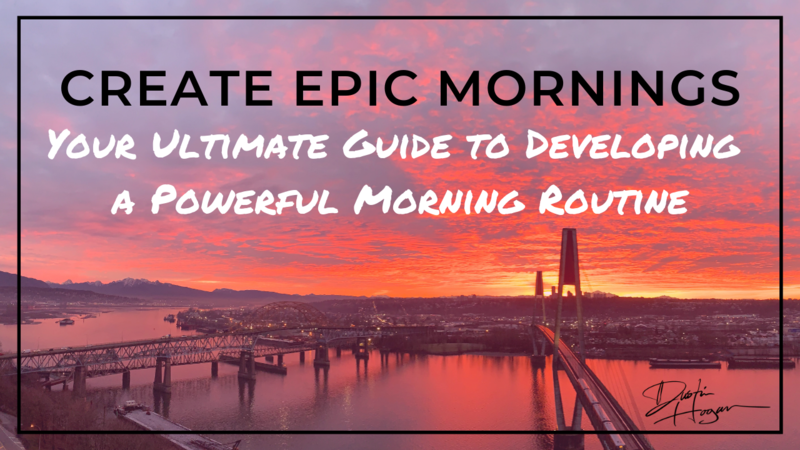 To make it easy to get rockin' with your morning routine I created an epic guide that brings it all together so you can create a morning routine. This guide will give you suggestions of habits and rituals you can add to your morning routine and a simple worksheet where you can plan it out! Well there ya go! You made it to the end of this article. I always enjoy putting together these longer posts because it is a great reminder for me as well. It really gets me thinking about what is important and where to focus my attention. 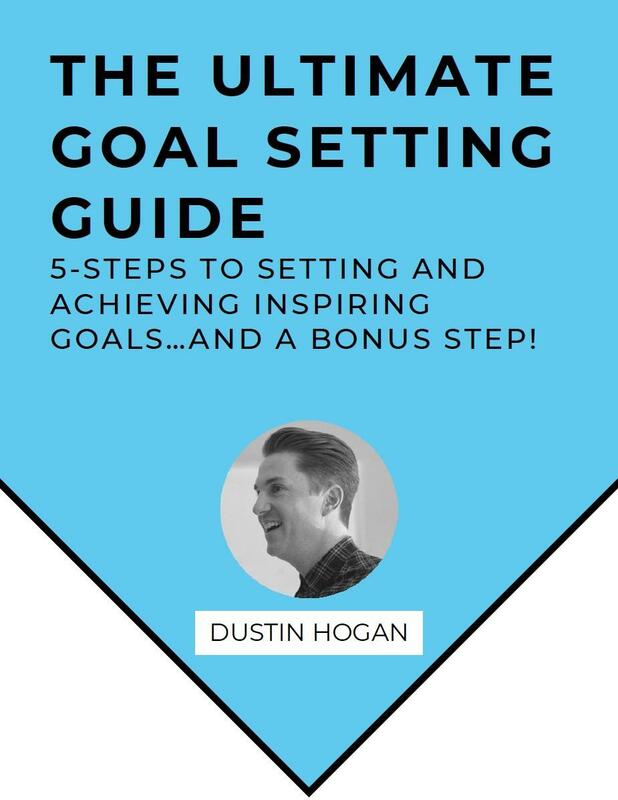 Hopefully you were able to take away some nuggets of information you can use to create a morning routine that helps you achieve your goals, and live a more inspired life! Please leave a comment below and let me know why creating a powerful morning routine is important for you. Also, it would mean the world to me if you could share this article with friends you think would benefit from it.